Our Monthly Tour - We recommend coming on a tour as your first step if you want to be on our List of Interested People. We conduct regularly scheduled tours on the first Sunday of each month (with some exceptions if it's a holiday weekend or no one has signed up). The tour starts at 1:30pm and takes about an hour depending on the size of the group. It's recommended that you wear shoes that are easy to take on and off, as some areas of our community are "shoeless" and the tour goes more smoothly if we don't have to spend too much time dealing with shoes on and off. "Make the Most of Your Cohousing Visits"
"A Tour is Worth a Thousand (or More) Words"
Tours are posted about a month in advance on the East Bay Cohousing Meetup calendar and homepage (scroll down the page). Please register for tours by RSVP-ing on that site (no drop-ins please). You will need to join the Meetup group, which will give you access to a wealth of information about Bay Area cohousing and shared housing. If you have trouble accessing the site, or have questions, please contact Yehudit Lieberman at yehudit@yehudit.net. 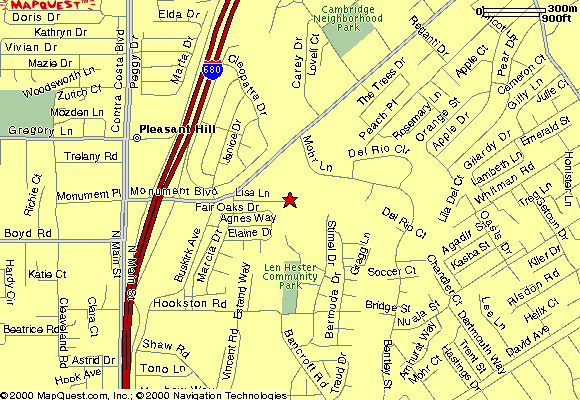 Our address is 2200 Lisa Lane, Pleasant Hill, CA 94523. But be careful if you are relying on your GPS - some of them put us in the wrong place because the numbers on our street are not consecutive. Use these maps instead. Take 24 East towards Walnut Creek. When it meets 680, take 680 North. Take the Monument Blvd. exit and at the end of the exit ramp turn right onto Monument. Go straight through the light at Buskirk and then immediately turn right on Marcia (just before the 76 station/Food Shop and make a QUICK left onto Lisa Lane. Go to the end of the street (it dead-ends at Fair Oaks Elementary School) and we're on the left (easy to spot - we're the orange-ish (we call it mango) colored buildings with blue roofs. NOTE: There is an apartment complex (Garden Park Apartments) also on our street, also on the left. We are beyond that, at the end of the street, just before the school. Park in the gravel area outside the fence that runs alongside our driveway (you can see it in the photo below). Don't worry about the no parking sign -- it's ok to park there during the day. Walk up the driveway to the Common House front door, or around the building to the patio area in back. To RSVP, see instructions above. Cohousing Communities in the U.S.
View the extensive archives to get a feel for what it's like to live in cohousing, what kinds of issues come up. You can also sign up to be on the listserv. Betsy Morris and Raines Cohen organize many community events around the Bay Area where you can meet others interested in cohousing. They've also been enormously helpful in publicizing our tours, events, and openings. Cohousing Communities in the U.K.
Finding Community: How to Join an Ecovillage or Intentional Community by Diane Leafe Christian. "Finding Community presents a thorough overview of ecovillages and intentional communities and offers solid advice on how to research thoroughly, visit thoughtfully, evaluate intelligently, and join gracefully. Useful considerations include: Important questions to ask (of members and of yourself), Signs of a healthy (and not-so-healthy) community, Cost of joining (and staying), Common blunders to avoid"
Cohousing: A Contemporary Approach to Housing Ourselves by Katie McCamant and Chuck Durrett. The book that brought the cohousing concept to the U.S. 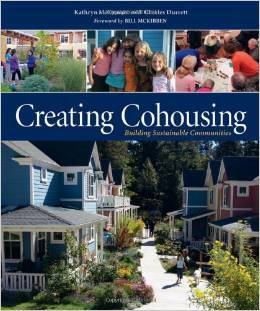 Creating Cohousing: Building Sustainable Communities by Katie McCamant and Chuck Durrett. Practical information for actually creating a community. Comments or questions? Contact our webmistress at hedgpeth@berkeley.edu.